fingers polish mania: OMG! It's more pink on my blog! If you have been paying attention, you know damn well, that I don't do pink. It's even in my profile tag line. However, one can't say no to a 5 year old who wants pink nails. Hopefully, you saw my post the other day, and saw my niece's choice of manis. She decided it was time to change her polish up and try something different. From left to right, we have Pop Art Pink, Lilacism, No Boundaries and Pink Parka, all Essies. She chose to do her thumbs in Lilacism which is a pastel purple, and the rest of her nails in Pop Art Pink, a light bubblegum pink. 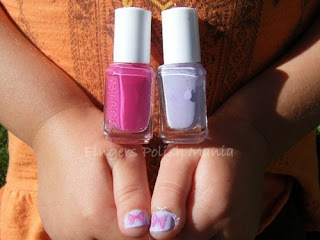 Then we used plate Konad M21 and the butterfly on her thumb stamped with Pink Parka which is a purplish pink, and the flowers stamped with No Boundaries, same plate. Here we have her posing with the bottles-the silliness is my doing! She said it was almost like having a tea party! I'm just glad to do her nails and have her like it! Here are closeups of her nails. Now I was barely able to get her to sit still and let the polish dry so there was NO way I could get her to sit for cleanup around her nails. So obviously, it's hard to paint a moving object, hence the messy cuticles! Unfortunately, the pink flowers are hard to see here, but the butterflies came out pretty perfect! Think we have a nail diva in the making! What do you think?